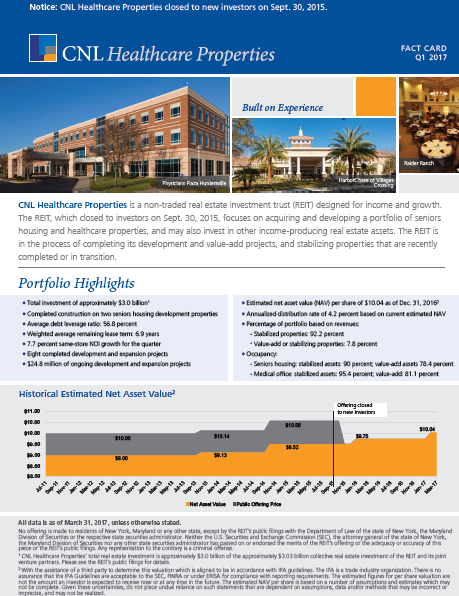 CNL Healthcare Properties closed to new investors on Sept. 30, 2015. Access to an asset class with solid growth potential. Drawing upon its management team's prior seniors housing experience, extensive healthcare operating knowledge and strong relationships with leading operators, the REIT has acquired and developed a portfolio of seniors housing and healthcare properties. To learn more about the portfolio, please explore the Fact Card. There is no assurance the stated objectives will be met. 1 The REIT cannot guarantee the amount of future cash distributions or if distributions will be paid at all. For the year ended Dec. 31, 2018, approximately 83 percent of cash distributions were covered by operating cash flow and 17 percent were funded by financing activities. 2 Launched in 2011, CNL Healthcare Properties is advised by CNL Healthcare Corp., an affiliate of CNL Financial Group. CNL Healthcare Properties' management team is employed by an affiliate of CNL Financial Group. The prior performance of REITs led by CNL may not be indicative of future results of CNL Healthcare Properties.